Although Mandalay was the capital of Burma for only a brief period of 25 years (1860-1885), it was here during the reign of King Mindon that the arts of Burma came to their final flowering. By 1852, as a consequence of the First (1824-26) and Second (1852) Anglo-Burmese Wars, Britain had gained control over the lower half of the country which left Mandalay and Upper Burma completely cut off from the coast and the outside world. Many believed that only divine intervention could save Burma from being entirely conquered by Great Britain. To assure purity and consequent strength and prosperity, King Mindon moved the capital from Amarapura to a new site a few miles to the north of the old capital at the base of a sacred hill. 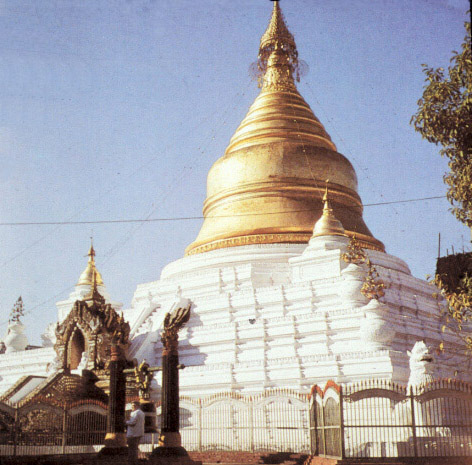 Tradition maintains that Gautama Buddha visited the sacred peak of Mandalay Hill with his disciple Ananda, and proclaimed that on the 2400th anniversary of his death, a metropolis of Buddhist learning would be founded on the plain below the hill. In this way, the shift of capitols was justified, and a standing image of Gautama Buddha pointing to King Mindon’s palace was subsequently erected on Mandalay Hill. The political center of the new city had the perfect geometrical form of a Buddhist Mandala, for which the city was named, Mandalay. Despite British control of the lower third of the country, King Mindon arranged for a remarkable International Buddhist Council to be held at his new capital, only the fifth such council or synod to be convened since the Buddha’s death in the 6th century BC! The King constructed a number of buildings in which to convene the synod and to welcome the delegate monks who arrived from throughout the Buddhist world. Among these were the Kyauktawgyi Temple at the foot of Mandalay Hill (1878), the Kuthawdawgyi Stupa and the Atumashi monastery and assembly halls. His mission in convening the Synod was to purify the clergy by standardizing the Pali scriptures – a traditional undertaking of great Theravada monarchs. At King Mindon’s command, 2,400 monks were assembled in the eastern hall of the palace to work on this project that required five months to complete. The completion of the synod was celebrated by the installation of a new hti atop the Shwedagon Stupa in Rangoon, then located in British held territory. Although the king’s actions produced extraordinary art and architecture, they were to no avail against the British military forces. In 1886, Mandalay and Upper Burma fell to the British at the conclusion of the Third Anglo-Burmese War and the last Burmese king, King Thibaw, was exiled to India. Fortunately, the Royal Guilds who created such exceptional works for the King remained in Mandalay where they have continued until today to produce art objects in the Mandalay style. Gold was thought to represent the radiance of spiritual energy and power and was all that King Mindon had to muster as the British gunboats came progressively closer to Mandalay. Gold, therefore, played an important part in the Mandalay Style that is characterized by the extensive use of gold leaf with bits of inlaid colored glass and silver mirror – a style seen to best advantage in the relatively dark interiors of the palace and monasteries. At the center of Mandalay was a massive square brick wall that measured a mile and one eighth (7 furlongs) on each side. This crenellated wall rose to 25 feet and was backed by an earthen rampart. There were twelve gates, three evenly spaced along each side. Each gate was surmounted by a square wooden pavilion, a pyatthat, and marked with a sign of the zodiac. This fortress was completed by a wide moat that averaged 225 feet in width and 11feet in depth. Consequently, in modern times this fortification has often been referred to as Mandalay Fort. The wall, however, was built not only to provide security but also to demarcate a sacred space for the royal palace that was situated at the very center of its three concentric enclosures. The homes of commoners and foreigners, shops and workshops, and the markets were located beyond the wall along a rectilinear grid of streets that also had the palace compound as its symbolic center. 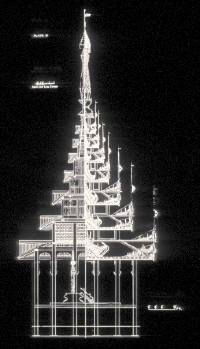 The plan of the royal palace in Mandalay is typical in many ways of the royal palaces found throughout Southeast Asia. It consisted of groups of wooden buildings erected on a masonry platform within a secure enclosure. All of these structures were one-storey buildings with teak floors and multiple roofs held in place by tall wooden columns. Because the palaces were important objectives in times of war and were made of perishable material, most have disappeared and are known in detail only from contemporary paintings, descriptions in chronicles, or from traveler’s accounts. The Mandalay Palace, constructed in 1857 from the disassembled palace at Amarapura, is the last example of this long tradition. Even though all the palace buildings were destroyed during World War II, they are well document by photographs and in architectural surveys. Inside the fortified brick wall was located two additional square enclosures. The first consisted of a teak stockade and brick wall inside of which were arranged formal gardens and groves of trees around ponds and canals. At the center of this enclosure were a low boundary wall and the rectangular palace platform that enclosed an area measuring 400 meters by 210 meters. All the palace buildings were erected on this platform that stood six feet tall and could be accessed by several stairways. The primary entrance was in the middle of the eastern façade, which was the beginning of an east-west axis along which all major buildings were arranged. The most important building along the eastern front of the palace was the Great Hall of Audience that consisted of a large, central throne room with two open, lateral wings to accommodate large gatherings. Immediately behind this building was the Hall of the Lion Throne where the most important ceremonies of state were performed. Since this building was considered the center of the universe, it was marked by the tallest tower within the complex that soared upward though seven tiers to 256 feet. Each of the eight throne halls was known by the animal or insect that was used in the decoration of its throne. Each throne hall consisted of a rectangular room that was divided in the center by a partition wall in which there was a doorway that opened on top of a high pedestal into the front half of the room. The King’s ascent to the throne was by a short stair in the "back" half of the room that led up to the door. After passing through the door, the king sat atop the pedestal and looked down upon his subjects who lay prostrate below him on the teak floor. Other buildings such as the royal sleeping quarters, the treasury, the armory, a theatre and recreation rooms, an elegant watch tower, the servants and soldiers quarters, stables, and elephant shed were placed on either side of the Throne Halls or at the periphery of the compound. 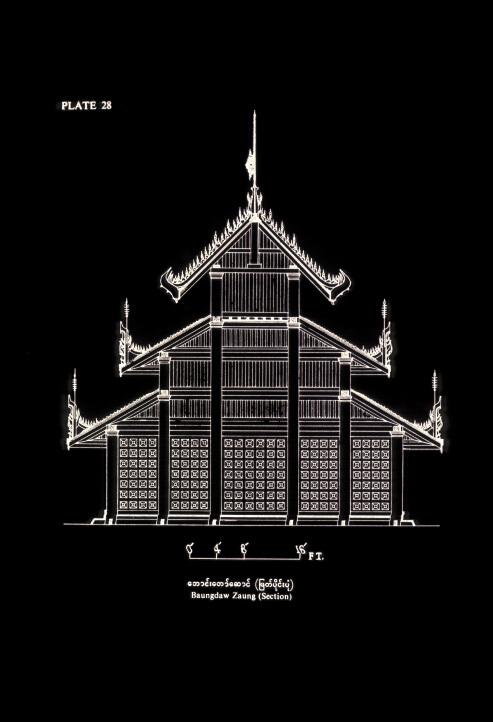 During the Konbaung period, throne halls so closely resembled the main hall within a monastery that when King Mindon died in his palace apartment in 1880, it was disassembled and reconstructed outside the palace walls where it has continued to be used as a monastery building. It is now known as the Golden Monastery or Shwenandaw. In 1853 King Mindon began construction of the Kyawktawgyi Temple at the foot of the southern stairway to Mandalay Hill. Although the temple was modeled on the Ananda Temple at Pagan, it contained only a single enormous seated image of the Buddha when finished in1878. This, however, had been carved from a gigantic block of white marble that had taken 10,000 men to transport the stone from the Irrawaddy to the temple site. This is the largest stone image of the Buddha in Burma. An innovative feature of the temple not found at the Ananda or elsewhere was the inclusion of marble images of the Buddha’s eighty-eight disciples in large niches in the compound wall. The Shweyattaw temple was built by King Mindon approximately half way up the southern approach to Mandalay Hill. to house an enormous standing image of Gautama Buddha that dramatically points to the royal palace on the plain below - the reification of the Buddha’s prophecy that a great Buddhist metropolis would appear there. The building is of interest because the names of Burmese lay donors cover the interior walls. The stupa at the center of the Kuthawdaw complex, the Mahalawka Marazein, is also a distant copy of the Shwezigon stupa at Pagan although generally much smaller in size. Filling the large compound around the stupa are 729 stupa shrines that each contain a marble tablet on which, for the first time, the entire Tripitaka was inscribed in Pali script. This text was prepared for inscription by 2,400 monks during an International Buddhist Synod that King Mindon convened in Mandalay in 1872. The complex is often referred to as "the world’s largest book" and is most impressive when seen from Mandalay Hill. The Sandamuni Stupa, a complex very similar to the Kuthwdaw, was built adjacent to its neighbor in 1866 by King Mindon. The central stupa, erected over the burial place of the King’s younger brother, is encircled by 1,774 stone tablets that record commentaries on the Tripitaka – an addition credited to the remarkable hermit of Mandalay Hill, U Kanti. According to legend, the Shwedagon was first created as a repository for eight hairs from the Buddha’s head that had been given to two merchant brothers, Tapussa and Bhallika, who had gone to India from Okkala village, now Rangoon, to worship the Buddha. If true, the Shwedagon would have been founded in the 5th century BC while the Buddha was still living. King Anawratha is reputed to have visited the Shwedagon during his military campaign to the south and had to be dissuaded from taking its hair relics back to Pagan. The earliest reliable records report that the stupa was renovated in 1372 by King Byinya U and again fifty years later by King Binnyagyan who raised the height of the stupa to 295 feet. The present shape and form of the stupa is the result of donations made by Queen Shin Sawbu who ruled from 1453-1472 and gave her weight in gold, 90 pounds, to be used to plate the exterior of the stupa. Earthquakes damaged the structure several times in the 17th and 18th centuries and it was again repaired. The Konbaung king Hsinbyushin replaced the hti in 1774, thus raising the monument to its present height of 330 feet. The stupa was built on the crest of a large hill, the top of which was leveled to create a spacious square plaza. This area was walled and, over time, has become progressively filled with numerous lesser shrines and buildings that ring the base of the main monument. The plaza is reached by four covered stairways that pass through the center of each wall. Each staircase opens onto the promenade circuit that connects the four major shrines, which are situated at the base of the stupa. Each of these shrines contain a number of virtually identical, Mandalay style Buddha images that are the major focus of worship. The form of the Shwezigon is one of the most complex in Burma. Inside the circular promenade course and above the main platform is a massive, square plinth terrace over 20 feet high that holds 68 small stupas. This area is used by men for meditation. A series of narrow terraces that progressively change in shape from square to octagonal to circular create a smooth transition from the square base to the dominant circular bell. Above the bell, the most highly ornamented section of the stupa consists of rings of lotus petals. Above these rings is a tapering section that resembles a lotus bud. A thirty-foot, gem-encrusted hti adorns the top of the lotus bud and this is crested by a gem-covered vane and orb. The profile of the monument closely approximates that of a regular and continuous cone and has become the emblem of Burmese Buddhism today. The brick monasteries of the Pagan Period were not built after the 14th century. 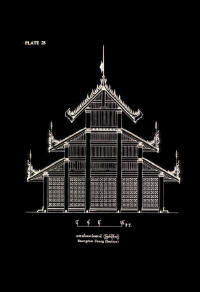 Instead, wooden monasteries appeared in great numbers throughout central Burma that are particularly Burmese in design. These structures were often of great size, some measuring up to 250 feet long by 45 feet wide. This monastery type is raised on pilings and consists of a single, long building having several rooms that rest on a wooden platform, which extends outward from the exterior walls, thus creating a terrace around the entire structure. Massive staircases made of brick and stucco give access to the main platform and serve to buttress the super-structure that was made entirely of wood. The monastery building itself had several rooms or spaces that were in linear alignment from east to west. The first room is a room where Buddha images and sacred texts are stored and, at times, informally displayed. This important space is marked by a tall tower and is linked to the main hall by a transitional, lower space where the head monk resides. The most important part of the building is located at its symbolic center and is a large rectangular hall divided into two square rooms by a partitioning wall. The room nearest the eastern entrance is a public space where a Buddha image is displayed and rituals involving both monks and laymen are celebrated. The western room is reserved for activities in which only monks are involved. To the West beyond the main hall, a storeroom is situated that may be attached or unattached to the main structure. The entire structure is visually unified by the continuous horizontal terraces and eaves of the various roofs. The exterior walls of the monastery as well as the terraces were lavishly decorated with wood carving often depicting Jataka tales in high relief. The multiple levels of the roof were also profusely adorned with fine carvings of flora, fauna, minor deities and humans. Of the several styles of sculpture that were produced during the Konbaung Period, the Mandalay style became dominant and has persisted until the present day. During the Konbaung Period there is a marked preference for stone and wood, although Mandalay style images were also made in metal. The most favored image in the Mandalay style is a seated Buddha in the position of calling the earth to witness, of which thousands were created. There was also a renewed interest in standing images, many of which are shown holding in their right hand a myrobalan fruit, a symbol for spiritual and physical healing. The left hand of these standing images often grasps the edge of the outer robe to hold it open. In other standing images, both hands are used to hold the outer robe open. Images of the reclining Buddha depicting the Parinirvana, also appear but in much fewer numbers than the other two body positions. Among the representations of Parinirvana, there is a new relaxed presentation where the Buddha’s feet are casually arranged rather than being stacked atop one another. Unfortunately, these images often create an impression that the Buddha is facing a television set, instead of death. Images in the Mandalay style have full, fleshy bodies with some slight difference in the length of the fingers and toes. The head is a broad oval in which the features arranged horizontally. A wide band, often inlaid with faux gems, borders the forehead and resembles a jeweled tiara. Small black curls cover a full usnisha that rarely terminates in a finial. The mark on the forehead, the urna, may have the spiral form of an "om" symbol. The eye brows are lower and more naturalistic, the mouth broader and more naturally smiling than those of Ava Period images. The ears are long, curve slightly and may touch the shoulders. The contours of the body are almost completely lost under heavy robes that are deeply undercut and have undulating hems inset with ornate bands of faux gems. 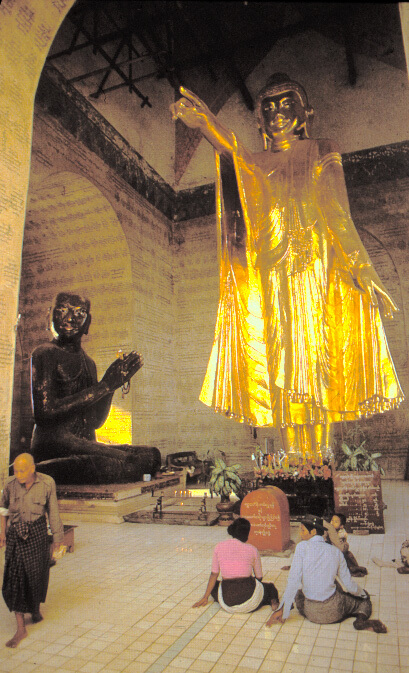 The Shweyattaw image of a standing Buddha pointing with his right hand is an iconic innovation of the Mandalay Period that is not found elsewhere in Burma or elsewhere in the Buddhist world. A limited number of small replicas were produced, evidently as souvenirs for pilgrims to the Shweyattaw temple since there is no known ritual use for these peculiar images. During the Konbaung Period, the number of foreigners who visited Burma increased and several artists and architects settled in the capital cities. These individuals as well as the increased availability of printed materials, encouraged the use of western perspective and the adoption of western modes of painting such as landscape and portraiture that were intended for the home instead of the temple or monastery. The paintings in the entrance halls of the Taungthaman Kyauktawgyi are a good example of the adoption of western perspective in creating a scene that fills the wall from horizon to zenith of the heavens. Cast shadows and distant haziness are used to enhance the illusion of reality. The stupas in the wall paintings are meant to be recoginizable pictures of stupas within the kingdom that the king had built or refurbished. British Officers who served in Burma during the First Anglo-Burmese War (1824-1826) often made sketches of the scenery and countryside as part of the Search for the Picturesque, a pursuit then fashionable in England. The best drawings were reproduced in England as aquatint prints, many of which were then sent back to Southeast Asia to those who had requested them. Two print series consisting of twenty eight views chronicle the progress of the war and, remarkably, only seven scenes depict military action, considering that the artists were British officers. These prints constitute the first series of naturalistic landscapes in the history of Burma and, even if they are not absolutely accurate in a photographic sense, the prints are the first large-scale, colored views of the Burmese landscape. The twenty-eight aquatints were executed from drawings made "on the spot" by two officers of the British Expeditionary Force in Burma, Captain James Kershaw and Lieutenant Joseph Moore. Although little is known about these officers, their work is exemplary of the fashionable pursuit of the picturesque. In an historical sense these prints do not accurately reflect the realities of a disastrous war which resulted from the combatants having only a vague notion of the aims and abilities of each other. However, the prints are of aesthetic interest because the circumstances of their origin are a direct outgrowth of the enormous interests in the picturesque that existed at this time, both in England and her colonies. The dichotomy seen here between picturesque fantasy and the reality of the war is a direct result of the strong British commitment to the Cult of the Picturesque which was one aspect of the Romantic Movement. Unfortunately, the failure to grapple with reality extended to the organization of the war which was undertaken from India and, because vital logistic information was lacking, resulted in heavy British losses from disease. The isolation of the Burmese Court at Ava about 300 miles inland helped create a false sense of security for the Burmese which increased their vulnerability to British military superiority, and thus assured a disastrous outcome to the war. Although the search for the picturesque in England and abroad was as much the province of the amateur as the professional artist, it was not to be causally approached. One writer, more insistent than most, on what might constitute a true rendition of the Picturesque was William Gilpin whose Three Essays on the Picturesque are specific as to the composition of landscape and subjects which will achieve the desired effect. His advice for sketching landscape proposed a clear delineation between the foreground, midground and background. The foreground might contain trees, tangled vegetation, and mossy stones, all loosely arranged to frame the midview. The midground in which increased depth recession creates expansive vistas holds the viewer’s interest with a variety of forms which delightfully distract the eye. The subtle tones that create these atmospheric vistas were readily produce by the aquatint technique. The misty blue-grey background halts the eye and teases the imagination about what view might lie beyond. The entire composition should be enlivened by variety, intricacy, and visual incident of imprecise detail. These effects may be further enhanced by changes in form, hue, and texture. Gilpin concludes that a figure or two may be introduced with propriety. The atmospheric power of the print was increased with the inclusion of turbulent skies, which gave the watercolorist and engraver an opportunity to increase the quality of "roughness" in a picture. The Cult of the Picturesque acknowledged that merely to enjoy a scene once was insufficient. Every attempt should be made to record the experience to renew it at leisure. Gilpin further suggests that even greater pleasure might result from contemplating the recorded scenes when relaxing at home, far from the wild and savage parts of nature. 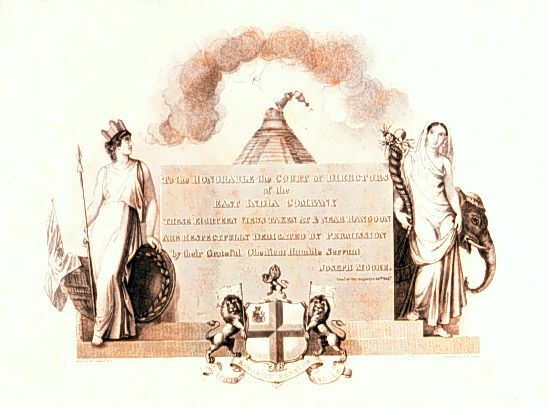 Paul Sanby introduced aquatint engraving to England in 1775. The new technique enabled much greater atmospheric variety to be achieved by insuring that the delicate shading of the fashionable watercolors be retained. This insured that even the multiple images of a plate would not decrease the beauty and subtlety of the original work. Theodore Fielding described the technique as an art which is so beautiful, yet so difficult, so peculiarly adapted to those subjects requiring broad flat tints of extreme delicacy or excessive depth, so capable of expressing light foliage on a dark background and the only style of engraving which can faithfully render the touch of the artist’s brush. Although the outcome of the war is now a matter of historical fact, the prints continue to excite the senses - and those prints that most inventively embody the formula for the picturesque still yield the greatest satisfaction. J. Moore. "The Harbour of Port Cornwallis, Island of Grand Andaman, with the Fleet getting under Weigh for Rangoon"
J Moore. "View of the Landing at Rangoon of Part of the Combined Forces from Bengal and Madras"
J. Kershaw. "Rangoon from Anchorage"
J. Moore. 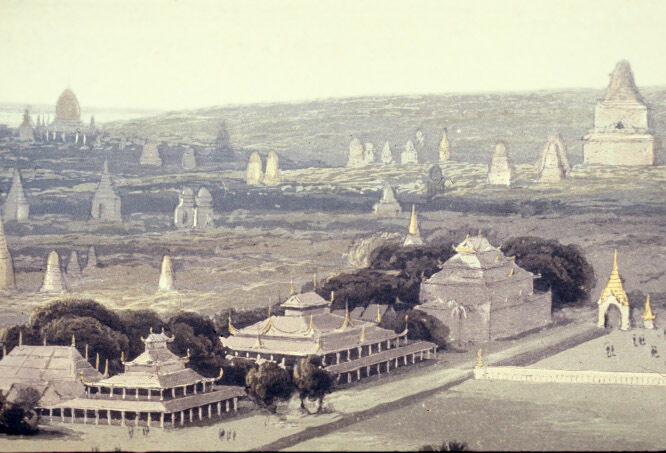 "View of the Great Dagon Pagoda and adjacent scenery on the Eastern Road from Rangoon"
J. Kershaw. "Dagon Pagoda, near Rangoon"
J Moore. "View of the Great Dagon Pagoda at Rangoon and scenery adjacent/to the Westward of the Great Road"
J. Moore. "The Principle approach to the Great Dagon Pagoda at Rangoon"
J. Kershaw. "Dagon Pagoda near Rangoon"
J. Moore. "Scene upon the Terrace of the Great Dagon Pagoda at Rangoon/Looking towards the North"
J. Moore. "The Gold Temple of the principle Idol Gaudma, taken from its Front/being the Eastern Face of the Great Dagon pagoda at Rangoon"
J. Moore. "Inside View of the Gold Temple on the Terrace of the Great Dagon Pagoda at Rangoon"
J. Kershaw. "View from Brigr. McCregh's Pagoda Rangoon"
J. Moore. "Scene from the Upper Terrace of the Great Pagoda at Rangoon, to the South East"
J. Moore. "Scene upon the Eastern Road from Rangoon, Looking towards the South"
J. Moore. "View of the Lake and part of the Eastern Road from Rangoon, taken from advance of the 7th Madras Infantry"
J. Moore. "The Attack upon the Stockades near Rangoon by Sir Archibald Campbell"
J. Moore. "the Storming of the Lesser Stockade at Kemmendine near Rangoon on the 10th of June 1824"
J. Moore. "Rangoon. /The Position of part of the Army previous to attacking the Stockades/on the 8th of July 1824"
J Moore. "Rangoon. The Storming of one of the principle Stockades on its inside/on the 8th of July 1824"
J. Moore "The Attack of the Stockades at pagoda Point, on the Rangoon River"
J Moore. "The Conflagration of Dalla, on the Rangoon River"
J. Kershaw. "North Face of the Great Pagoda, Prome"
J. Kershaw. "Prome from the South heights"
J. Kersahw. "View fromt the West Face of the Great pagoda, Prome"
J. Kershaw. "Meloon from the British Position"
Jane T. Bailey, "Some Burmese Paintings of the Seventeenth century and Later: Part I -A Seventeenth-century Painting Style near Sagaing", Artibus Asiae, Vol. 38 (1976), pp.267-86; "Part II - The Return to Pagan", Artibus Asiae , Vol. 40 (1978), pp. 41-61; "Part III - Nineteenth-century Murals at the Taungthaman Kyauktawgyi", Artibus Asiae, Vol 41 (1979), pp.41-63. Charles Duroiselle, Guide to the Mandalay Palace (Rangoon, 1925; reprinted Rangoon, 1963). Sylvia Fraser-Lu, "Buddha Images from Burma: Part 1, Sculptured in Stone", Arts of Asia, Vol. XI, (1981), pp.72 - 82; Part 2, "Bronze and Related Metals", Arts of Asia, Vol. XI, (1981), pp. 62-72; Part 3, "Wood and Lacquer", Arts of Asia, Vol. XI, (1981), pp. 129-136. Elizabeth H. Moore, Shwedagon: Golden Pagoda of Myanmar (Thames and Hudson, New York, 1999). Taw Sein Ko, The Mandalay Palace, Archaeological Survey of India, Annual Reports (1902-1903), pp.95-103. V.C. Scott O’Connor, Mandalay and Other Cities of the Past in Burma, (London, 1907; reprinted Bangkok, 1987). U Tun Aung Chain & U Thein Hlaing, Shwedagon (The Universities Press, Rangoon, 1996).